Today, today, today. 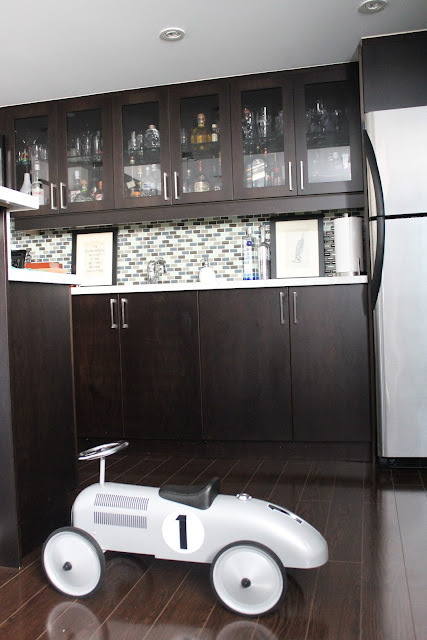 We have one of my newest favorite go to blogs, Sundeep from Designwali who is sharing their favorite space, their man cave bar. How shocking, unexpected and outrageous?!?! A woman sharing their man bar for their favorite space. You go girl. Let's be honest though, anywhereI I can pour a cocktail is fine by me. Sundeep has an awesome aesthetic that incorporates ethnic touches blended with modern finishings. She really is a genius and this "man cave" (should be woman grotto) obviously shows that off. You will instantly be drawn to an alcoholic beverage. I promise! Hey folks! My name is Sundeep and I write a little Canadian blog called Designwali. Totally psyched that Lindsay actually approached me to share one of my favourite spaces in my home with all of you. Believe it or not, I hardly even spend any time in this room, probably because it is really one of my husband’s favourite spaces. 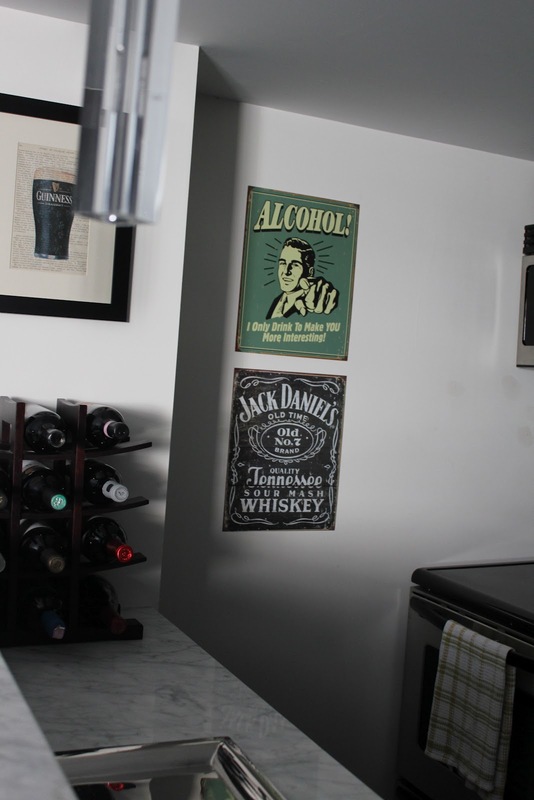 Ladies and gentlemen may I present our ‘man cave bar’. We started with a completely unfinished basement and decided to outfit it with a small kitchen, which I thought would be great for entertaining and resell value. Somehow the kitchen morphed into a bar and we haven’t looked back since. We opted for dark cabinets because most of our basement is painted Benjamin Moor Cloud White with one dark wall painted Benjamin Moore Willow. We were going for moody and masculine and I think we got it! 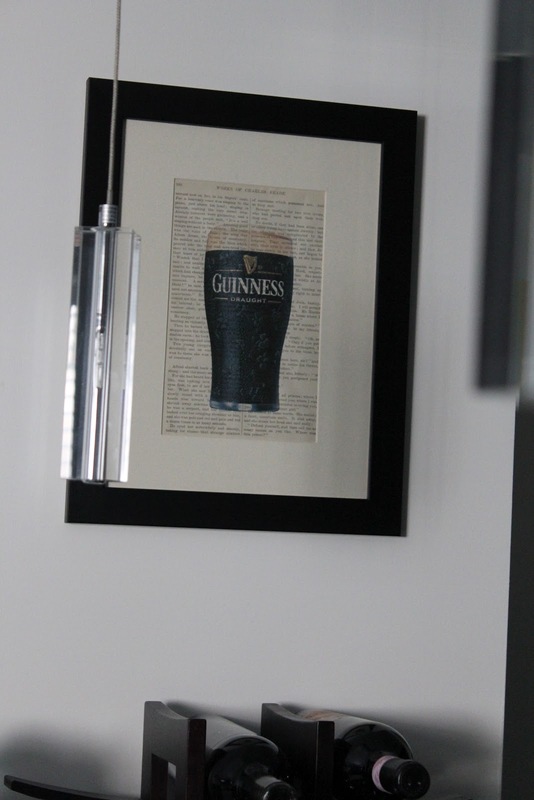 The Guinness, vacuum and patio prints are from a fun seller on Etsy and husband picked up that Havana print on a boys trip not so long ago. We opted for marble counter tops (because I got a good quote from a local outfitter) and I think it steps it up a notch. Now my husband would naturally say that the glass incased alcohol collection is the true focal point, but or me its got to be the art. I picked up the two tin art signs from a New York trip and our guests love them. It probably helps that they are usually a little ‘happy’ when looking at it too. Love it! What a handsome man cave! Gorgeous...so rich and sophisticated. Designwali is so talented! Love the Man Bar!! So handsome and fun! Very nice! Great job Sundeep! oh thats AWESOME. not showing this to my hubs tho. my little cottage would be a huge bar instead of a home if he had his druthers. Way to go Sundeep, that is a fabulous space! My husband would be jealous! AWESOME!!! I love the idea of having a grown-up hang out in the basement. Its beautiful! Such a great kitchen! Love all the little details! Love it....the dark has such impact, very chic and sophisticated! It's a great spot and I bet there's tons of fun times gathering around the bar!